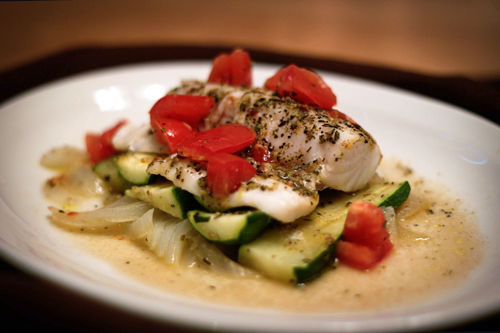 For part two of my “99 pieces of fish in the fridge ” trilogy, I chose a recipe that I have made often and that everybody loves, even the rug monkeys (a.k.a my daughters, a.k.a alpha and beta child). Everything gets wrapped in packets of foil, individually portioned. Just like a TV dinner only you can pronounce all the ingredients and there is no little section containing some unidentifiable dessert-like substsance that nobody ever eats. I used four pieces of fish (wiper) from the hubby’s catch. We love this dish because all of the flavors come together during the cooking to create something that tastes fresh and “springy” (like the season, not your mattress). I think that the key ingredients for the flavor of this dish are the anise seeds and the Herbs de Provence. You can find them both in the spice section of most grocery stores. One of the spices in the Herbs de Provence is lavender which has such a heavenly fragrance and adds something special to the dish, so try to find it if you can. If not, you can substitute Italian seasoning. 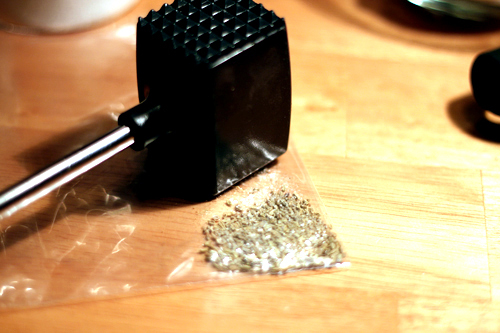 You can crush the anise seed using a mortar and pestle, or a plastic bag and any heavy object. I use a meat tenderizer. Husbands, though heavy objects, don’t work quite as well. Make sure to wrap the edges of the foil very tightly to create a well sealed bag that will steam the fish, and you will have some delicious juice to mop up with a piece (or three) of crusty French bread. Preheat oven to 425°F. Place about 1 tsp anise seed in a plastic sandwich bag and crush using with something heavy, such as a rolling pin or meat tenderizer. 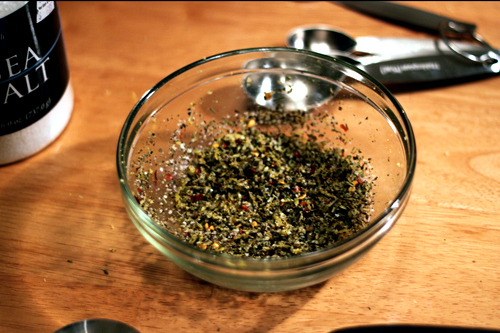 Mix ½ tsp of the crushed anise seeds with the lemon zest, Herbs de Provence, red-pepper flakes, salt and pepper. Prepare 4 pieces of aluminum foil, folded in half for double thickness and large enough to fold over and crimp closed, about 14 inches. 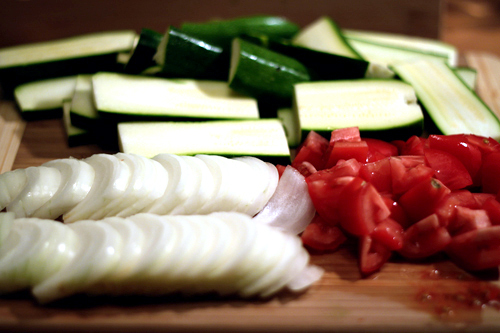 On one half of the foil, layer the onions, then the zucchini and season with salt and pepper. Top with the fish and sprinkle with the herb topping. Top with the chopped tomato and drizzle with olive oil. 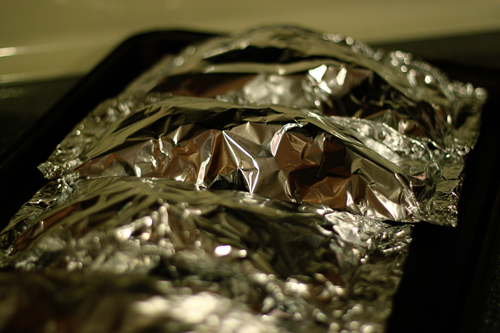 Fold the foil over and crimp to seal. 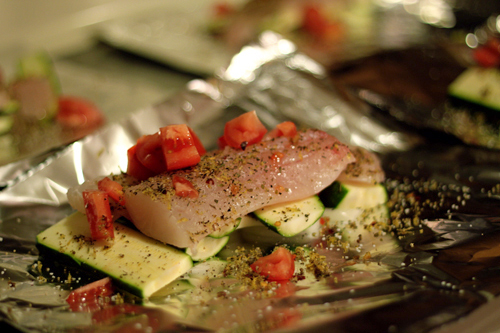 Place foil packets on a sheet pan and then into the over for 20 minutes. Allow the packets to rest for 5 minutes before serving. Transfer to serving plates or place packets on a plate, cut an opening in the top and serve straight out of the packet with lots of fresh crusty French bread. OK, I’ve got to ask. LOL. How do you seed a tomato and why? I am going to have to try that pinapple salsa. Sounds wonderful! Oh and you should try fish with a spicy Mango, pineapple salsa!